The smashing of the cows. | Come Here To Me! The smashing of the cows. Two of the fibreglass animals which form part of the CowParade NI were targeted at the weekend. The two life-sized sculptures were located in the heart of the city centre at a landscaped park opposite the Guildhall. The cows were painted by local artists and community groups at the Playhouse Theatre and at Maydown. They are now being removed so the damage can be assessed, and as a result of the destruction they will be relocated indoors once repaired. Next year marks a decade since fiberglass cows were placed across the city of Dublin as part of the same project, with many of them vandalised and ultimately moved indoors. Even then, they were targeted in many cases. 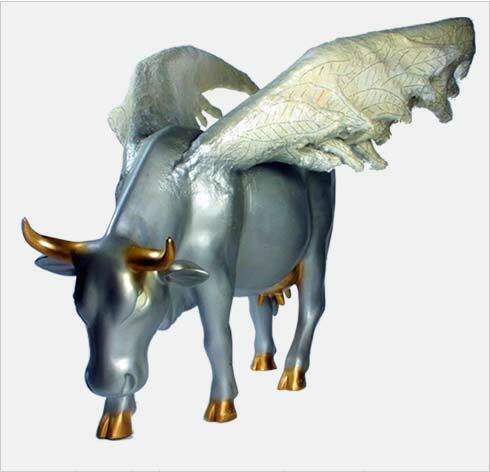 ‘When Cows Fly’ – one of the vandalised Dublin cows. CowParade events have been staged in over 75 cities worldwide, including New York, Istanbul and Milan. The project began in 1999, and it describes itself as the “largest and most successful public art event in the world.” The project has raised in excess of thirty million Dollars for charities worldwide, yet it’s 2003 run in Dublin was marred by the destruction of many of the cows, with Dublin becoming the only city at the time where the exhibition had to become an entirely indoors affair. Robert Ballagh, John Rocha, Gavin Friday, Graham Knuttel, Andrea Corr, Ronnie Woods and Felim Egan were just some of the names involved in the project here, and Rocha’s cow would sell for an incredible €125,000, bought by the Wagamamma restaurant in Dublin city centre. The cows proved an irresistible temptation to Dublin vandals. In an interview with The Irish Times, Gerard Beshoff (director of the CowParade in Dulin) noted that at first only 10 cows were exhibited on the streets, and all 10 were vandalised within days. One cow was decapitated, while another had its wings cut from it. The cow on Liffey Street, which stood outside Pravda, was damaged in such a manner that a saw would have been required. The head of the cow was later discovered outside Cleary’s on O’Connell Street. 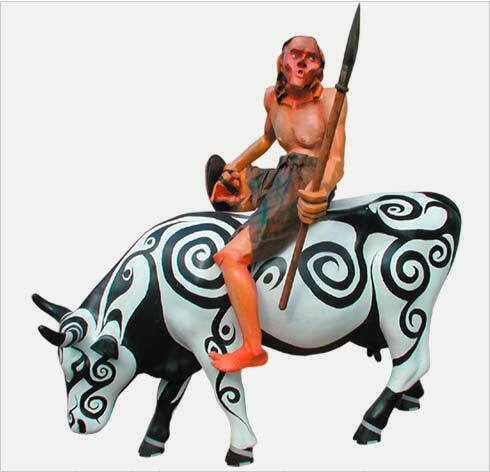 ‘Moo Chulainn’ displayed on Dawson Street. Organisers had planned to place 69 of the cows on the streets of Dublin, but the plan was quickly abandoned. Of the 69 which were placed around the capital indoors and outdoors, half were vandalised. They were eventually auctioned in November at the Four Seasons Hotel, before the CowParade moved on to pastures new. In other cities, the public loved the cows so much that they would defend them if anyone tried to vandalize them, but in Dublin, the cows were smashed, stolen, beheaded and covered in graffiti, even after the exhibit was officially over and the cows were moved to less public places. Wagner-McCoy’s suggested that this phenomenon went back to the destruction of monuments in Dublin historically, which had been found politically disagreeable by Irish nationalists. Perhaps a better historic precedent was the ‘Bowl of Light’, which had sat on O’Connell Bridge prior to part of it being flung into the river by vandals in 1953. 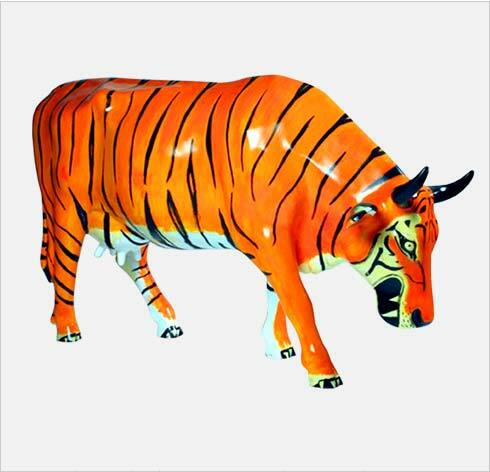 ‘Tiogar: Celtic Tiger’ – Displayed in the IFSC. Reblogged this on Matthew Mulligan. “part of me had to laugh” … why exactly ? It’s not funny and the same thing happened recently to the Lionel Richie phone box piece. The artist put a lot of effort into this and it lasts 24 hours. Ha ha hilarious. What a great joke. You can’t put any piece of street art up in Dublin it will get smashed by scumbags. But that’s hilarious ha ha, go on the scumbags. Well the joke’s on you. Mick Minogues Lionel Richie piece was original and, while not great art, could certainly be classified as good art, plus it was a good use of defunct phone boxes (I think there was a previous reference on this blog lamenting its destruction). The cows had been in 75 other cities by the time our arts bureaucrats jumped on the bandwagon and the concept therefore far from original. 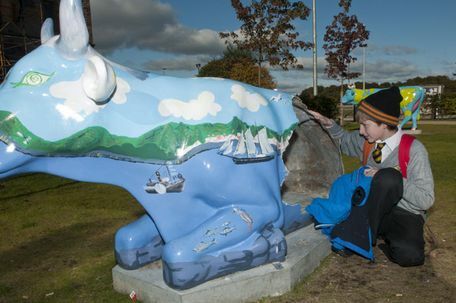 While the merit of much art is a subjective matter, I wold argue that the cows are/were shite art and symptomatic of the lazy half-arsed approach to public art in Ireland. I should add that I am referring to the lazy half arsed approach from officialdom, I am sure there are loadsa go-getter artistic types up to great things, probably despite officialdom, and some of them even get mentioned here from time to time!